Tully Athens has always dreamed of following in the footsteps of her hero Michelle Payne. Of living up to the Athens name and becoming the third generation of women from her family to rule the track. But Tully’s never been sure she’s got the nerve, and when her mother is killed in a horse racing accident, her whole world is shattered. RACE GIRL is the highly anticipated third book in The Go Girls Chronicles - bestselling stories of gutsy girls in action sports, by Leigh Hutton! 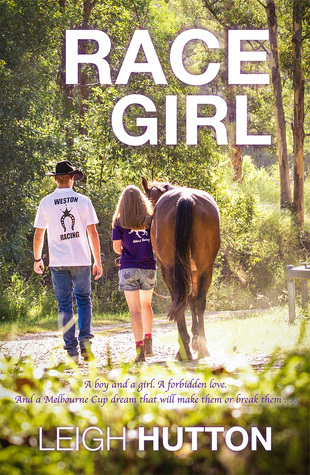 Tully’s life hasn’t been the same since her mother tragically died during a horse racing accident, and her father has forbidden her from riding competitively for fear she could also end up injured or worse. However, she and her father are strapped for cash and the Weston family want to buy their property, Avalon Downs. Then Tully ends up getting a deal on Dahlia, a young horse in need of some serious TLC. If Tully can save Dahlia, then Dahlia might just be able to save Tully and her father in return. This is the third book in Leigh’s The Go Girls Chronicles series and after highly enjoying the first two, I was much looking forward to reading this latest edition. I wasn’t disappointed. Leigh has a wonderful way of telling a story that utterly draws you in and makes every moment believable. I adored how this story made references to the other books in this series, Rev Girl and Jump Girl. The scene in the hospital in which Tully gets to meet Clover was so awesome because I loved reading Clover’s story and to get a little update on her was great! The characters in this book are beautifully written. Tully is a strong and determined protagonist, and I loved getting to see her grow and develop throughout the course of the story. Her passion for the horses and for racing was touching, as was her willingness to do whatever she could to save Avalon Downs. She meets and starts to fall for the gorgeous Brandon Weston, but being a Weston makes him forbidden fruit for Tully, so their relationship has challenges from the very start. This was an interesting aspect of the story and I enjoyed seeing how it affected these two characters. The chemistry between them is undeniable and the scenes that they shared were excited to read. All of the various relationships within this book were interesting to learn about. There were touching but also heart-breaking scenes between Tully and her father. Their relationship is tested over the course of the story and I was rooting for them to work things out for themselves and their life at Avalon Downs. I also highly enjoyed Tully’s friendship with Tam. The two girls had some hilarious moments and I loved the dialogue between them. Race Girl is fast paced throughout with some epic racing scenes that will leave you on edge! The story was wrapped up in a perfectly satisfying conclusion that left me with a huge smile on my face, and it has definitely made me excited for the upcoming stories that this series has to offer.